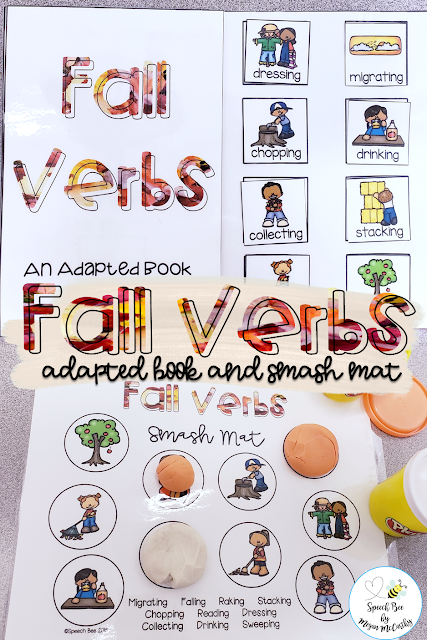 I just wanted to pop in real quick and link to my newest adapted book for fall verbs! These books are a simple and effective way to target some fall vocabulary in easily adaptable sentences. Each page starts with a what question about the character or item from the page, ex. "What is the girl doing?" The bottom of the page is a fill in the blank answer where the verb is used in present progressive format, ex. "The girl is drinking apple cider." 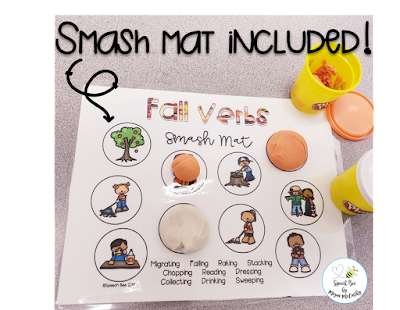 There are also 6 vocab verb cards included, and a smash mat! I don't know about you, but my students will work on just about anything when there's play-doh involved! As always when creating an adapted book, be sure to have plenty of laminating sheets and velcro on hand! I've included some affiliate links below to give you a quick and easy shopping experience!